The goal of this is to bring basic analytic services to the network edge, improving performance by positioning computing resources closer to where they are needed, thereby reducing the distance that data needs to be transported on the network, improving overall network efficiency and performance. Fog computing can also be deployed for security reasons, as it has the ability to segment bandwidth traffic, and introduce additional firewalls to a network for higher security. Fog computing has its origins as an extension of cloud computing, which is the paradigm to have the data, storage and applications on a distant server, and not hosted locally. With the cloud computing model, the client can purchase the services from a provider, which delivers not only the service, but also the maintenance and upgrades, with the plus that they can be accessed anywhere, and facilitating work by teams. Fog computing has a number of advantages. By adding the capability to process data closer to where it is created, fog computing seeks to create a network with lower latency, and with less data to upload, it increases the efficiency at which it can be processed. There is also the benefit that data can still be processed with fog computing in a situation of no bandwidth availability. 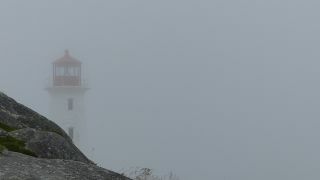 Fog computing provides an intermediary between these IoT devices and the cloud computing infrastructure that they connect to, as it is able to analyze and process data closer to where it is coming from, filtering what gets uploaded up to the cloud. A downside of cloud computing is that all this computing over the network relies heavily on data transport. While broadband internet access has generally improved over the last decade, there are still challenges with accessibility, peak congestion, lower speeds on mobile 3G and 4G cellular networks, as well as occasions of limited internet availability whether underground, off the grid or on an airplane. This lack of consistent access leads to situations where data is being created at a rate that exceeds how fast the network can move it for analysis. This also leads to concerns over the security of this data created, which is becoming increasingly common as Internet of Things devices become more commonplace. Physically, this extra computing power closer to the data creation site in a fog computing configuration gets located at a fog node, which is considered a crucial ingredient in a cloud-fog-thing network. The fog node, which is located in a smart router or gateway device, allows for data to be processed on this smart device, so that only the necessary data gets further transmitted to the cloud, and decreases the bandwidth used. An example of a use case for fog computing is a smart electrical grid. Electrical grids these days are quite dynamic, being responsive to increased electrical consumption, and lowering production when it is not needed to be economical. In order to run efficiently, a smart grid relies heavily on real time data of electrical production and consumption. Fog computing is ideal for this as in some cases the data is created in a remote location, and it is better to process it there. In other situations, the data is not from an isolated sensor, but rather from a group of sensors, such as the electrical meters of a neighborhood, and it is better to process and aggregate the data locally, than to overload the data throughput by transmitting the raw data in its entirety. Another use case for fog computing is for IoT applications, such as the next generation smarter transportation network, known as V2V in the US, and the Car-To-Car Consortium in Europe. Dubbed the ‘Internet of Vehicles,’ each vehicle and traffic enforcement device is an IoT device which produces a stream of data, and connects to the other vehicles as well as traffic signals and the streets themselves, with the promise of safer transportation for better collision avoidance with traffic that flows more smoothly. Each vehicle has the potential to generate quite a bit of data just on speed and direction, as well as transmitting to other vehicles when it is braking, and how hard. As the data is coming from moving vehicles, it needs to be transmitted wirelessly on the 5.9 GHz frequency in the USA; if not done properly the amount of data could easily overload the finite mobile bandwidth. A key component of sharing the limited mobile bandwidth is the processing of data at the level of the vehicle via a fog computing approach through an on-board vehicle processing unit. Fog computing has also been applied in manufacturing in the IIoT (Industrial Internet of Things). This allows connected manufacturing devices with sensors and cameras to gather and process data locally, rather than send all of this data to the cloud. Processing this data locally, in one wireless real world model allowed for a 98% reduction in packets of data transmitted, while maintaining a 97% data accuracy, in a distributed data fog computing model. In addition, the energy savings are ideal for effective energy consumption, a crucial feature in the setting of battery powered devices. While fog computing is a more recent development in the paradigm of cloud computing, it has significant momentum, and is well positioned for growth. Highlighting this trend is the Fog World Congress that highlights this growing technology.